Your grill is an ideal place to bake potatoes while you prepare the rest of your meal. When you close the lid, all the heat you need is trapped inside to cook the potatoes all the way through. You can also avoid having to turn on your oven and heat up the house. 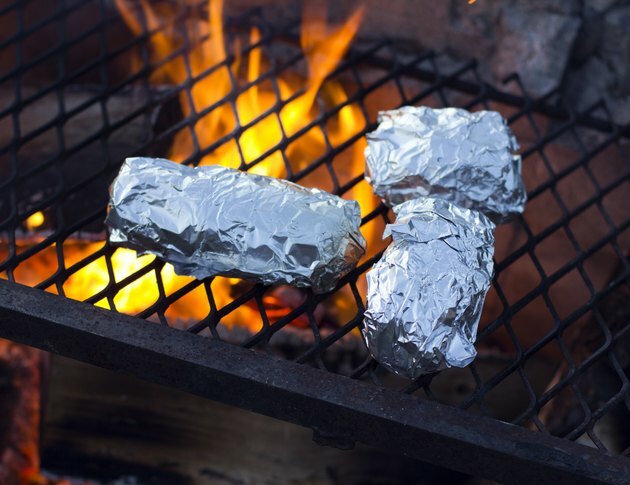 Wrapping the potatoes in foil helps prevent the skin from burning and enables you to add complementary flavors to the potatoes as they bake. Tear off squares of heavy duty aluminum foil and brush the inside with vegetable oil. Spray the inside with non-stick spray if you prefer. Poke a fork into the flesh of a potato four or five times around the entire surface. Wrap the foil around the potato so it is completely sealed with no openings. Repeat the preparation process with as many potatoes as you want to bake and add the potatoes to your grill. Set them over the direct heat on a gas grill and close the lid, or directly on the coals of a charcoal grill. Bake them for 30 to 45 minutes, or until a toothpick slides into the potato easily. Parboil your potatoes for 10 minutes before wrapping, to reduce the baking time. Cut the potatoes in half and place a dab of butter and slice of onion between the halves before wrapping in foil to add flavor. Cube your potatoes and bake them in a foil packet on the grill with fresh herbs, butter, onions and peppers for a different presentation.